Unlike areas in the northern part of the country, Texas offers milder winters and a temperate, year-round climate. 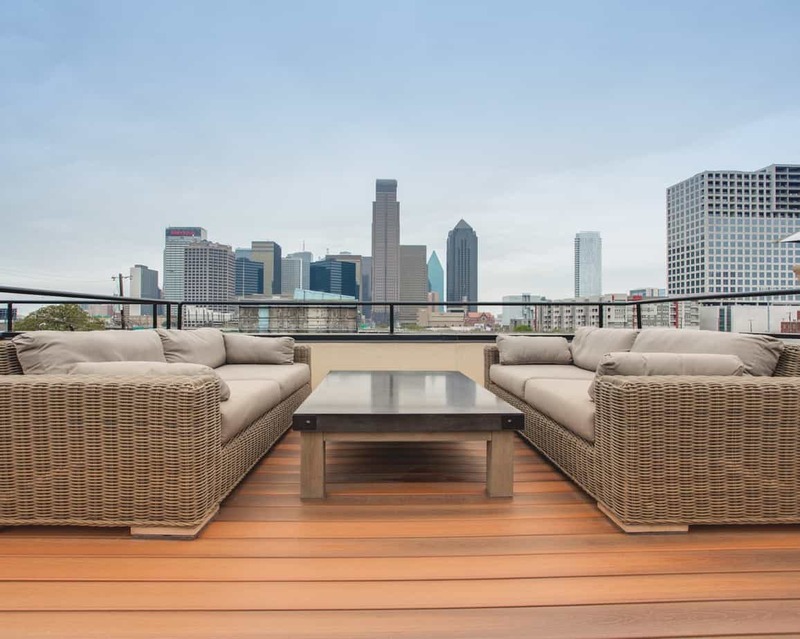 While many people in the rest of the country are confined to the indoors during fall and winter, Texas residents can enjoy outdoor living most of the year. By designing a backyard with an inviting atmosphere, functional features, and beautiful landscaping, you can create a comfortable outdoor space for entertaining and relaxation. 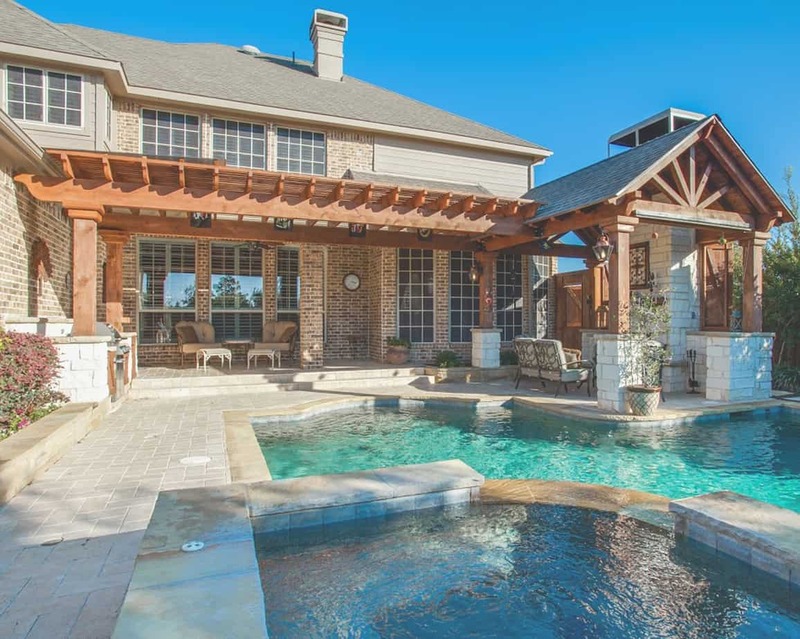 Whether you prefer cookouts with friends and family, fun activities with the kids, or just relaxing with a good book, you can design an outdoor living area where you’ll love spending your time. Fall in love with the outdoors again: A variety of different shaded, open, and elevated areas create the perfect outdoor living space – for homeowners and guests alike! 1. How Do You Want To Use Your Outdoor Living Area? If you love to entertain outdoors, you need to create an inviting backyard setting with amenities for guests. A patio or deck adjacent to the house will provide comfortable areas for cooking and dining, as well as casual conversations. You can add great features like an outdoor kitchen, a wet bar, and a cozy fireplace where your guests can mingle and stay warm on chilly evenings. With a spacious back yard, you may even have room for an outdoor spa, fire pit, or exotic koi pond. If you have children and pets, create a backyard area where they can play safely. Design a play area where the kids can enjoy a variety of outdoor activities without destroying the lawn and the flowers. Add mulch around trees and bushes to prevent brown spots from pet urine in your grass. 2. Is Your Backyard Big Enough To Accomplish Your Goals? When you determine how you want to use your outdoor living space, make sure your backyard can accommodate your plans. With a large yard, you can include more outdoor features without making areas feel crowded. If you have a small yard, it’s best to limit your outdoor features so you don’t minimize or destroy your landscaping. A lush, green landscape with trees, shrubs and flowers adds natural appeal and relaxing ambiance to any backyard. Don’t use too many features in a small backyard or your outdoor living areas will feel crowded, contrived, and uncomfortable. 3. Does Your Existing Landscape Enhance Your Design Plans? Make sure your existing landscape enhances your design plans for new outdoor living areas. If you’re building a new patio or deck next to the house, your existing landscape may not require changes, but if you’re adding a spa, pergola or fire pit in the backyard, you may need to create a new landscaping plan. Consider adding beautiful outdoor walkways, private garden pathways, relaxing gathering spots, benches for quiet conversations, and landscape lighting. Whether your yard is spacious or small, your outdoor living spaces will be more appealing if you establish good traffic patterns that provide safe movement and visual interest. 4. What Can You Afford? When researching backyard design ideas in magazines and online websites like Houzz, it’s easy to envision them for your home. When you research actual costs, though, you may find that your $20,000 budget doesn’t go very far. Before you start planning an outdoor living area for your home, it’s essential to establish a realistic budget and create an affordable design plan. Talk to a local contractor or design-build firm about your wants and needs. They can help you with design ideas, construction costs, and materials that complement your home and fit your budget. Whether you plan to entertain or just relax on the weekend, you will need comfortable seating areas. If you plan to use your patio, deck, or pergola, you can create zoned areas for multiple functions. Create a cooking and dining zone with an outdoor table and comfortable chairs to provide adequate seating for family and guests. Create a different area with cozy lounge chairs and ottomans or a relaxing hammock for lazy afternoons. To gain space and functionality use benches with storage underneath, decorative containers that function as tables, and ottomans that can be moved around. 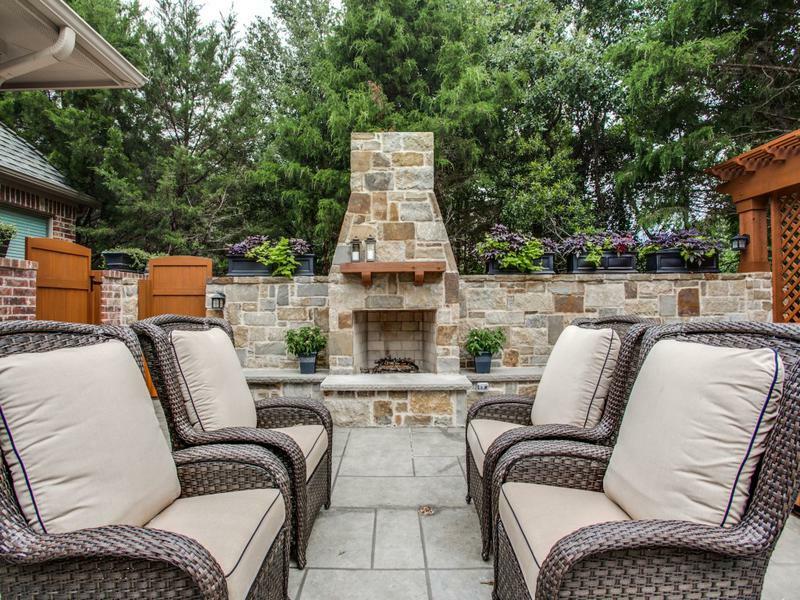 Just think about the great family cookouts, romantic dinners, and backyard barbecues you can have year-round with an outdoor kitchen and a wet bar. An outdoor fireplace will cost more to build than a fire pit due to special features and safety regulations. Since a fireplace has a chimney and firebox, it will need proper ventilation for safety. You will need to get a building permit and meet local code regulations. A fire pit is built low to the ground with no chimney, so it doesn’t require ventilation or a building permit. It’s basically a hole that serves as a firebox with low surrounding walls. It’s less expensive and easier to build, and it can be installed on your patio, deck, or anywhere in your back yard. If you want a backyard with unique appeal, create visual interest that draws attention. 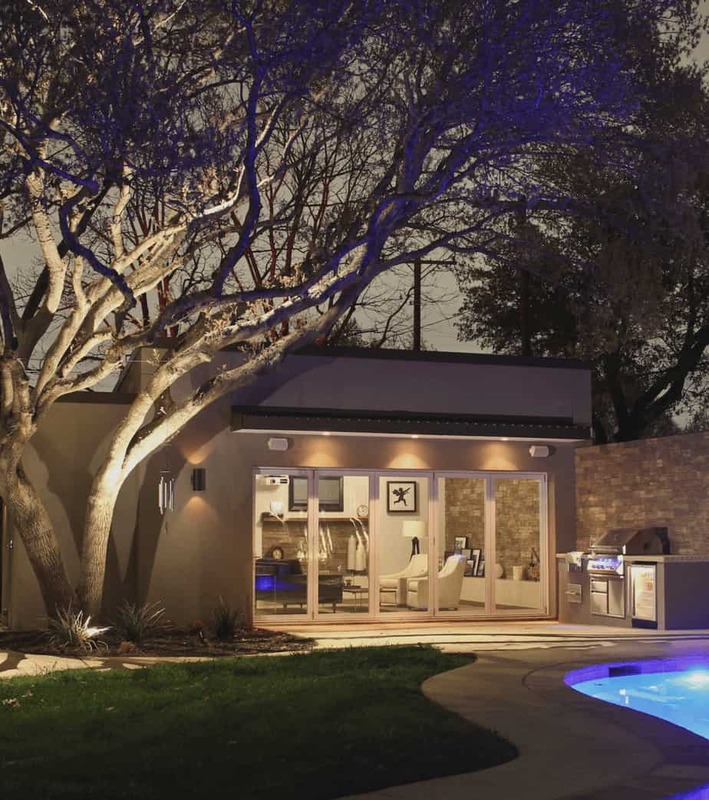 You can do that with a unique focal point, as well as landscape lighting that highlights special features. Butterfly gardens, Zen gardens, herb gardens, and moon gardens make a great focal point in any yard. They create special areas in the yard that add natural beauty, relaxing atmosphere, and edibles for family meals. The sound of water trickling down a tiered water fountain, rock waterfall, or outdoor pond creates a soothing, relaxing atmosphere. Adding water features to your backyard will instantly create a focal point that draws attention and enhances the beauty of your landscape. Landscape lighting is one of the easiest and most affordable ways to add visual interest to any yard. It provides a soft glow that creates an inviting atmosphere. Use spots and uplights to highlight trees and focal points, and pathway lights to highlight walkways and garden areas. Schedule a visit to showroom today or contact us for an estimate for your outdoor living project!